Hot mic records troubling conversation about solar regulations – First – States are required to set a price and contract lengths to promote alternative energy resources under the Public Utility Regulatory Policies Act, or PURPA, which has been on the books since the energy crisis of the 1970s. Second – “Well,” replies Lake, “the 10-year might do it if the price doesn’t. And at this low price, I can’t imagine anyone getting into it. Now that the pricing of solar power is compelling, and getting built in volumes bigger than the fossil fuel and local paid off politicians can deal with – they’re happy to start breaking the law. This is how reality works folks – unless you do something about it – here’s his name: Public Service Commissioner Bob Lake. meet stella vie: the family car that runs entirely on solar power – cute-looking ride can achieve a range of 1000 kilometers (620m) from the energy generated during one sunny day in the netherlands – Since the solar car articleThat’s a lot of land to cover in a small country with a low amount of sunlight in a freaking car from the solar panels on the top alone. No, this car doesn’t have creature comforts in a luxury sedan – but it also doesn’t kill people. I’m really amazed. Ciel & Terre starts construction on the world’s largest floating PV plant – Floating solar power is becoming a thing, and its becoming because China put out tender for 1GW of it. This is the second project as part of that project. Check out simulation. Wonder if the panels being used are bifacial to allow sunlight through to the water and to absorb the reflected sunlight (which there would be much of). ‘Bring on more renewables,’ U.S. regulator says as grid study looms – “Do I recognize we have to be attendant to supporting the different ways in which renewables work? Yes,” says Colette Honorable, a member of the Federal Energy Regulatory Commission, “I don’t see any problems with reliability, and I say bring on more renewables.” – Educated facts from real adults, who actually know what they’re talking about, instead of morons from Texas with stupid looking glasses and their terrorist friends. Germany allocates more funds for PV storage incentives – German government, however, has said that approximately 10,000 incentive applications will be accepted for the program in 2017 – What’s cool is that Germany expects installed energy storage systems to increase from 52,000 systems to possibly 100,000 systems in 2018. That means there are a lot of systems getting installed without these incentives. Net-zero homes grew record 33 percent in 2016 – 8,023 net-zero homes built-in Canada/USA in 2016. The largest multi-unit project (663 units, completed and occupied) and the largest single-family project (350 units, in design) are both at the University of California Davis’s West Village, a huge residential project that’s expected to grow substantially in the coming years due to expansion. California pushing the envelope again. 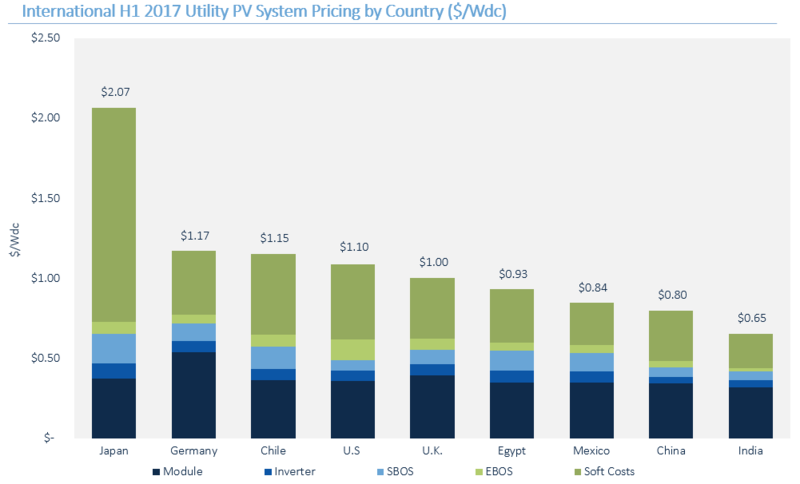 Solar Costs Are Hitting Jaw-Dropping Lows in Every Region of the World – See image below – 65¢/W in India due to simple systems and low labor costs. Double that price in Germany and Chile – but guess what – double the price is still 1/2 of what it was just a few years ago. The utility scale solar power revolution is clearly global. Henbest: Energy to 2040 – Faster Shift to Clean, Dynamic, Distributed – A great article from a wonderful report, but one key section of it really caught my attention – and it gives you the very clear reason why utilities will break laws (and more?) to survive: Australia sets the pace, with as much as 45% of total capacity located behind-the-meter by 2040. We think that Brazil, Japan, Mexico and Germany are each likely to have a decentralization ratio of over 30% – These are huge countries with giant amounts of money being spent on electricity. Once these people start generating their electricity on site, the utilities will never get them back. That’s a lot of lost money. As an aside – if you want to see a lot of beautiful data, read the article. A tweet that will be a global story soon – ‘distributed smalls scale solar at $1/W’ – that would be an amazing number. The Europeans have managed to get small solar at a much better price than the USA, and it all comes down to labor and paperwork costs – not hardware. That means it can happen anywhere else because European labor ain’t cheap. A roll out solar panel built by Deployable Space Systems and Air Force Research Laboratory wasn’t able to roll back up, so it was released to burn up on re-entry. It was going to be destroyed either way – but still sorta sad to watch it slowly float away.